I am joking, of course Milan is a lot more than this! In order to help you plan your stay in this beautiful Italian city, I have prepared a guide of the 15 best things to do in Milan. You will see, there are a lot of places of historical or cultural interest, starting with the most emblematic tourist attraction, the Milan Cathedral. In addition, I will give you itineraries to visit Milan in 1, 2 or 3 days as well as my selection of the best accommodations in town. So, what to do in Milan? Here are the best 15 points of interest! 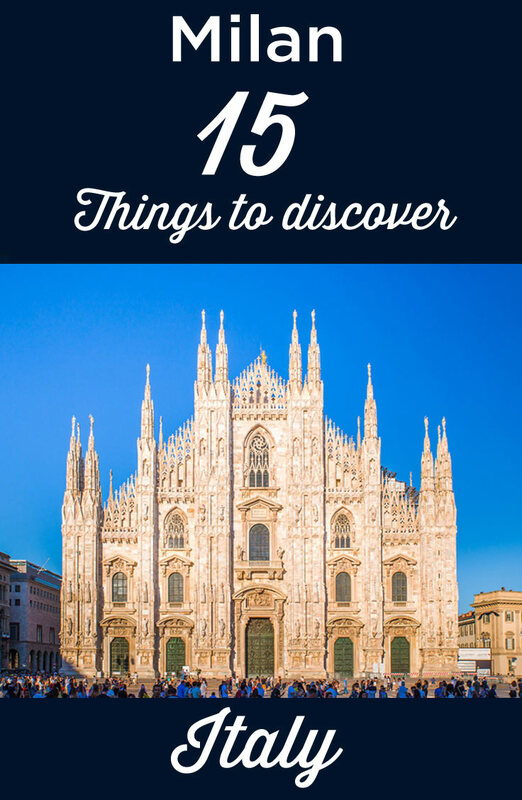 Let’s start this list of the top things to do in Milan with the must-see monument of the city: The Milan Cathedral (“Duomo di Milano” in Italian). The symbol of the city is located on Piazza del Duomo, the historic center and best starting point for a stay in Milan. 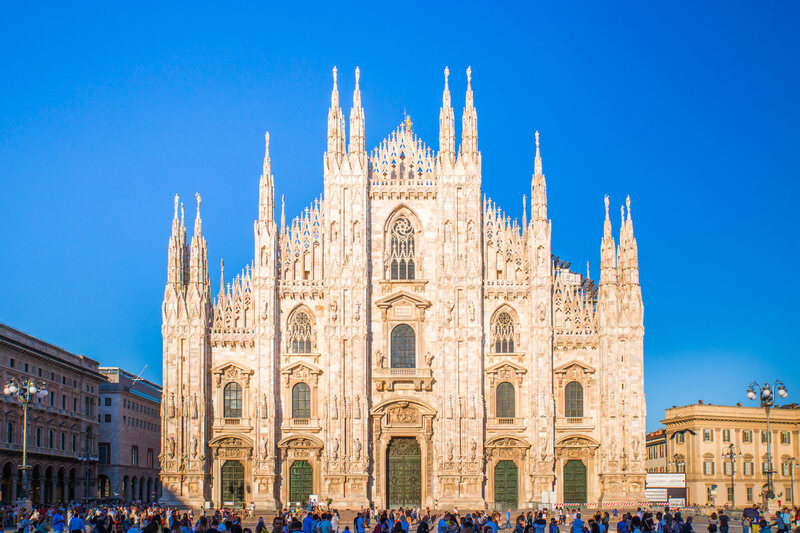 Started in 1386, the construction of Milan Cathedral took nearly 500 years. It was finished under the order of Napoleon Bonaparte who absolutely wanted to be crowned as king of Italy there. This architectural wonder is the third largest cathedral in the world, after St. Peter’s Cathedral in Rome and the Cathedral of Seville. From the outside, you can admire its facade entirely made of perfectly carved stones. The 2.000 white marble statues and 136 arrows makes the whole thing super impressive! When seeing it, you clearly understand why it’s nicknamed “the marble hedgehog”. The interior is also worth a visit, with its 5 sumptuous naves and 52 columns, each representing a week of the year. You can also admire sarcophagi and tombs of several archbishops, as well as a crucifix made by the master Leonardo Da Vinci himself! But the highlight of the visit is the possibility to go on the terrace of the Cathedral. From up there, the view of Milan is breathtaking! You can choose to go there either by stairs or elevator. The second option is a bit more expensive: €12 instead of €7 for the first. As Milan Cathedral is the main attraction of the city, you will always have to wait in line (often for several hours) to go inside. Personally, during my visit in July, I had never seen such a long waiting line for a monument! Just outside the cathedral, on the Piazza del Duomo, you can visit the Galleria Vittorio Emanuele II, another top attraction in Milan. The place is very photogenic and luminous, with its magnificent arcades and superb dome made of glass and iron. 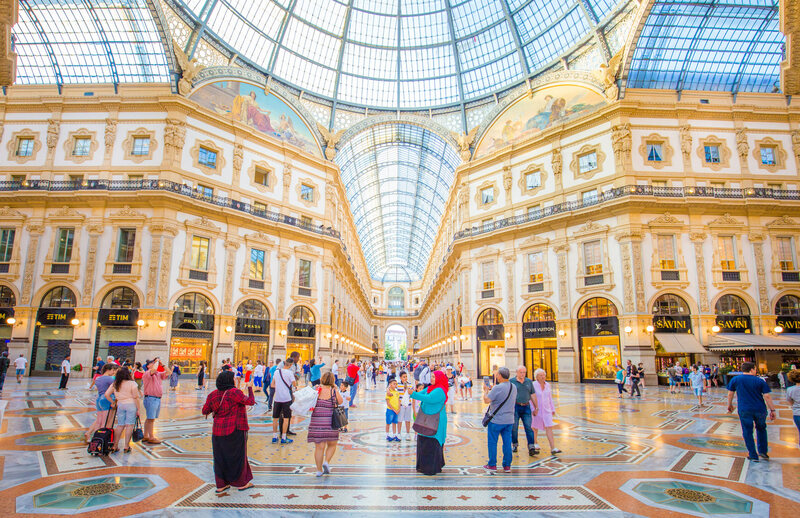 Nicknamed “Il salotto”, the Galleria is considered to be one of the most beautiful in Europe, so don’t miss it during your trip to Italy! Inside, you can find some of the most famous fashion designers stores, including Vuitton and Prada, as well as many high-end restaurants. You should definitely go there with a full wallet, if your sweetheart decides to do a little shopping! Leaving from the Piazza del Duomo, along the Galleria Vittorio Emanuele, you will arrive directly on Piazza della Scala. As the name suggests, it’s where La Scala, the famous Milan Opera house is located. Along with the San Carlo Theater in Naples and the Fenice in Venice, it’s one of Italy’s 3 most prestigious operas. Masterpieces of Italian opera have been created here, such as “Norma” by Vincenzo Bellini or “Otello” by Verdi. Also, one of the greatest classical singers of all time, Maria Callas, has performed in La Scala. I didn’t have the opportunity to see the interior, but it’s world famous for being sumptuous. So you should really go if you can! The exterior facade however, is quite simple. On the left of the building you can visit the Museum of La Scala and its collection of musical instruments, opera costumes and historical documents. 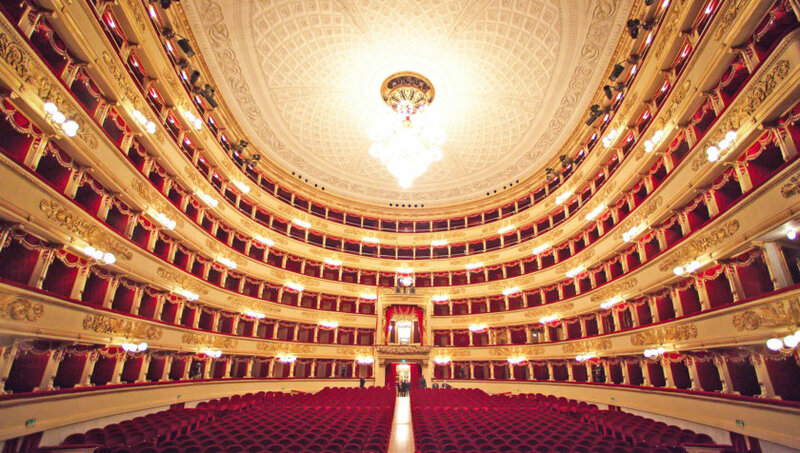 If you wish to attend a concert, an opera or ballet performance at La Scala, you can buy your tickets directly on the official website. And if you would like to book a guided tour of the Opera and the museum entrance, you need to go on this on this website. Once again, booking in advance is the best way to save time! 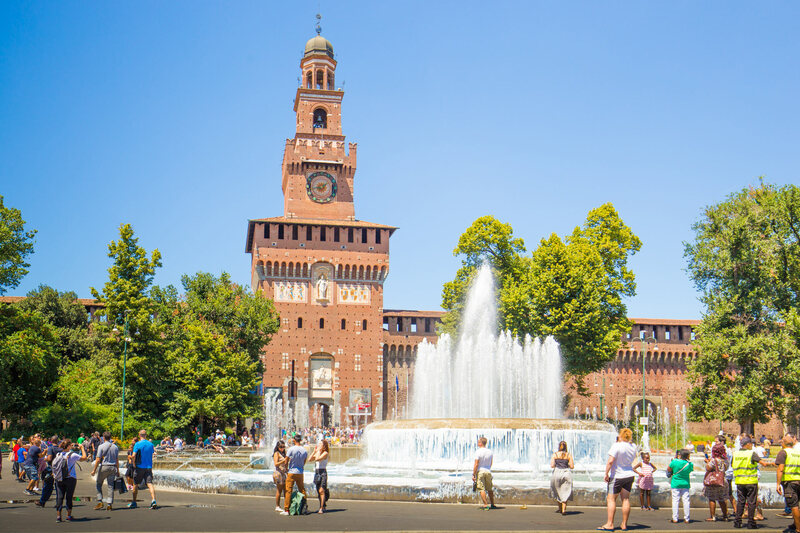 If you take Via Dante from the Piazza del Duomo, you will arrive directly at the main entrance of the Sforza Castle, another iconic monument of Milan. This very impressive castle is located in the center of the city. it was built in 1358 by the famous Visconzi family to protect and defend the city against its enemy, Venice. Destroyed and rebuilt multiple times, it’s famous for having hosted Leonardo DaVinci workshops during the Renaissance period. The Antique Furniture and Wooden Sculpture Museum. The vast inner courtyard of the castle is open to the public for free. It often hosts cultural events. When I was there, there was an event celebrating the launch of Game Of Throne season 7. They installed a central stage with a huge screen to broadcast episodes of the past seasons. The reconstruction of the iron throne and the transformation of the fountain at the entrance with ice stalactites were also quite popular. Winter is coming! If you walk across Sforza Castle, you will arrive directly in Parco Sempione. Just behind the Sforza castle, you will find the green lung of the city. The Parco Sempione (Simplon Park in english) is the largest public park in Milan and a perfect place to rest a bit. 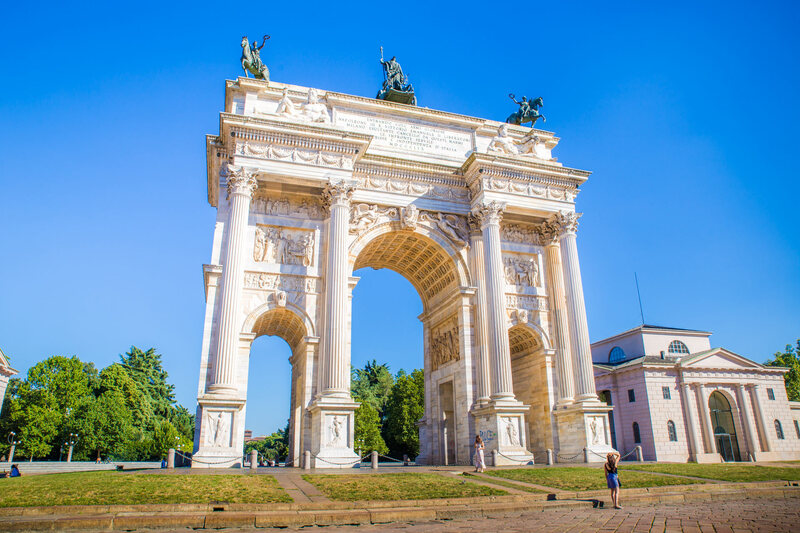 The Arco della Pace, the triumphal arch of Milan, built to celebrate peace. I loved the architecture! Without a doubt the most famous church in Milan, Santa Maria delle Grazie is known for housing one of the most beautiful masterpieces ever made, the painting of the Last Supper by Leonardo da Vinci. Leonardo da Vinci painted the Last Supper in the refectory of the monastery, now called “Cenacolo” in reference to the masterpiece. Thousands of tourists come every year to admire this painting representing the last meal of Jesus Christ. Remember to book the visit in advance, you can only visit by appointment and in small groups of twenty people for 15 minutes. You can by your tickets on this website. Since we are talking about Leonardo da Vinci, You may know that the city of Milan has dedicated him a huge museum: the Museo nazionale della Scienza e della Tecnologia Leonardo Da Vinci (Museum of Science and Technology Leonardo Da Vinci). It’s one of Milan best tourist attraction. Installed in a former 16th century monastery, the museum exhibits more than thirty models reconstructing the bold inventions of Leonardo Da Vinci, ranging from war machines to measuring instruments. The exhibition devoted to Leonardo da Vinci is only a tiny part of this gigantic museum. 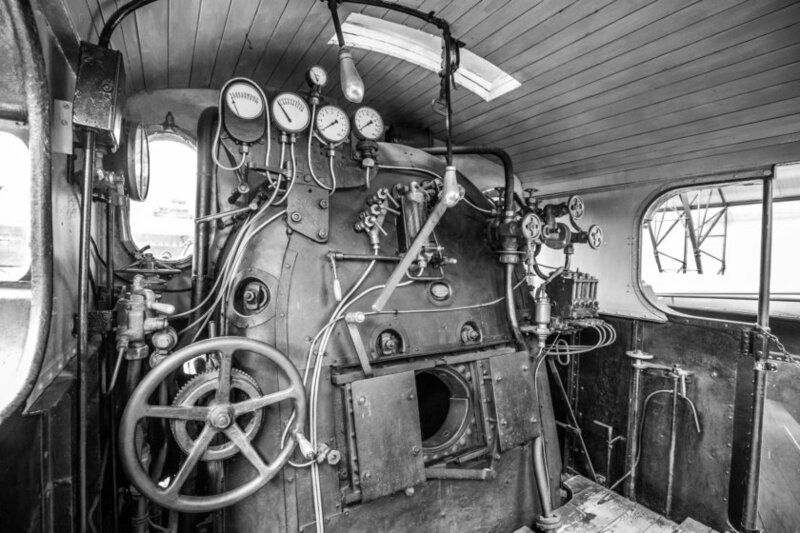 Over several floors, you will discover aviation, rail transport, automobile, naval transport, space, communications and many others. In order to avoid waiting at the entrance of the museum, you should book your tickets in advance here. It’s what I always do when I travel, and It saved me countless hours of waiting in line! The Museum of Science and Technology is ideal for a family visit. However, it’s very big, so you will need to plan about half a day to visit it. Even by going fast and not necessarily reading everything, I spent almost 3 hours there, so don’t go there an hour before closing time. A nice thing: you can bring a snack, a room has been specially arranged for meals. 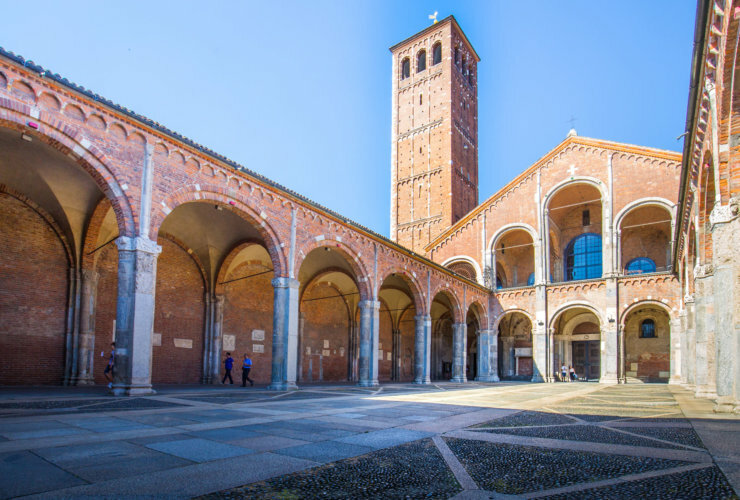 As it’s very close to the Museum of Science and Technology, I advise you to go have a look at the Basilica of Sant’Ambrogio after your visit of the museum. Named after the patron saint of the city, a first church was built on site in 386. The current basilica, one of the oldest in the city, was completed in 1099. The exterior of the church, with its 2 brick towers of different heights and beautiful atrium is quite unusual. This point of interest isn’t very well known by tourists, but it’s definitely worth a look. A great opportunity to take nice pictures! Inside, you can see: the sarcophagus of Stilicon and the crypt, where the remains of Saint Ambrose, Saint Gervasus and Saint Protasus are located. You’re looking for an unusual place to visit in Milan? You should then definitely visit the Cimitero Monumentale di Milano (“Monumental Cemetery” in English). Now you think I am weird! Ok, let me tell you something: even if I like zombies stories, walks in cemeteries after dark aren’t really my thing. 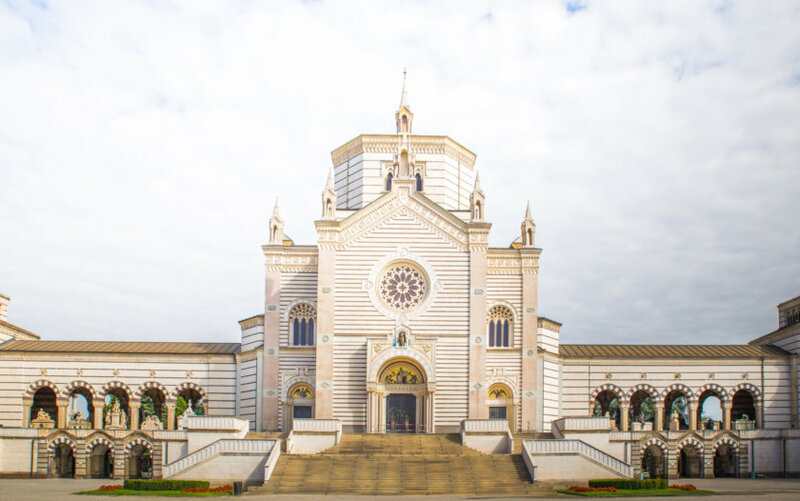 The Monumental cemetery of Milan however is really worth seeing, because it’s really special. More than a cemetery, it is a huge open-air museum with many artistic tombs. At the main entrance, you can see the graves of the most important citizens of the country. Amongst the most popular, you can find a pyramid, a white tower or a marble four-poster bed shaped tomb. Milan wealthy families have really competed to stand out, as the numerous sculptures of angels or statues can attest. At the entrance, don’t forget to take the map of the cemetery. You don’t want to miss anything of this unusual visit! Good thing to note: It’s closed on Mondays. The Pinacoteca di Brera (“Brera Art Gallery” in English) houses one of the most important art collection in Italy. 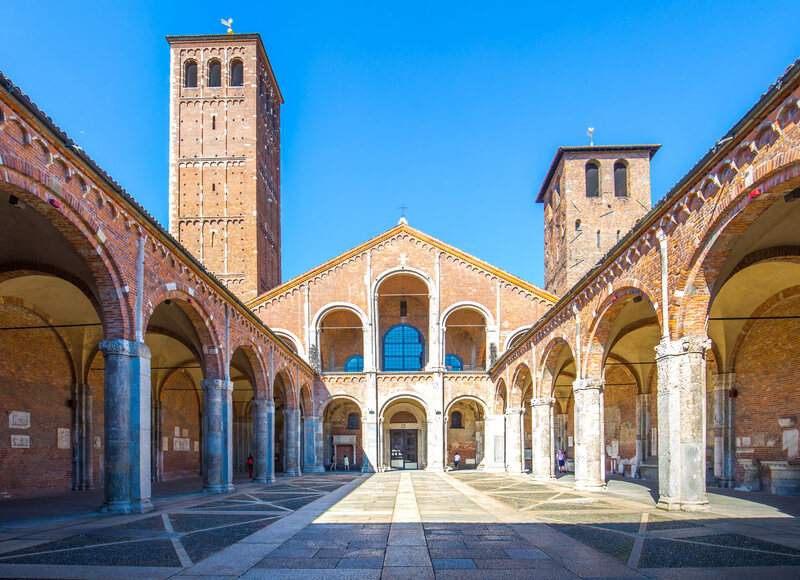 It’s located in the Palazzo Brera, built on a former monastery. At the time, monks were the first to make it a cultural center with a school, an astronomical observatory and a library. Since then, the collection of the Art Gallery just kept growing. Today, the works are exhibited in about forty rooms and are arranged in chronological order, according to the art technique used. Amongst the most famous masterpieces, you can admire Raphael’s ”The Marriage of the Virgin” or Caravaggio’s ”Last Supper to Emmaus”. Information for the schedule and entrance fee is available on the Pinacoteca di Brera official website. The tickets for the museum can be bought in advance here. As the seat of the Milanese government for many years, the Royal Palace of Milan has become an important cultural center of the city. Several exhibitions are organized every year, whether of modern or contemporary art, fashion or design. The Royal Palace is over 7,000 square meters, and is home to many paintings lent by some of the most prestigious museums in the world. You can also visit the museum of the palace. It presents its own history as well as the city and population of Milan history. 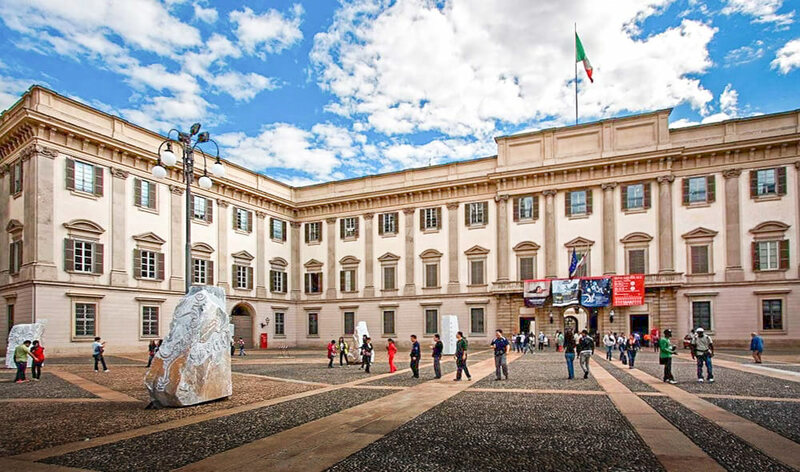 Divided into 4 parts, the museum allows you to explore the Neoclassical, Napoleonic, and Restoration periods, ending with the unification of Italy, a very important period in the history of Milan. Don’t forget to walk in the courtyard of the palace, to enjoy a unique view of Milan Cathedral. It’s little known to tourists! Another place you shouldn’t miss in Milan is the Navigli district, crossed by canals. It’s the most picturesque of Milan! Originally, this system of canals connected the Po to the lakes of the region. They were used to transport goods and supply Milan with water. The system of dam and locks used was invented by Leonardo da Vinci (him again!). Even the marble used for the construction of the Milan Cathedral, was transported by these canals. Today, you can go to the Navigli district, walk quietly along the canals and enjoy a drink or a meal on one of the restaurant terraces. The best is to go there at the end of the day, with the light of the setting sun. It’s a very romantic neighborhood, especially in the evening with the lights reflecting in the canals and the local life starting in the numerous bars and restaurants. Yep, we had to include a short paragraph about shopping in Milan in this article. The city is internationally recognized as the capital of fashion and design after all! For shopaholics, we advise you to go to the quadrilateral of fashion (“Quadrilatero della moda” in Italian) composed by the following 4 streets: Via Montenapoleone, Via della Spiga, Via Sant’Andrea and Via Manzoni. If you have a big budget, you will find everything you need in the boutiques of great Italian designers like Versace and Gucci. This is also where the Milan Fashion Week takes place. And for those who want to shop without ruining themselves, go to The Highline Outlet, located in the heart of Milan. You will find a lot of brands at discounted prices. If you still haven’t found happiness after that, there is always the “I love Milan” T-shirt solution, a classic! If you have time during your stay in Milan, go to the business square to admire a unique monument. 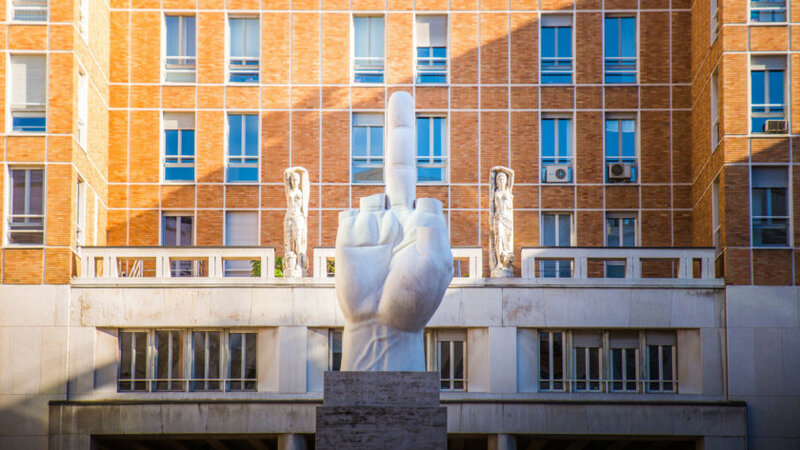 Located in front of the Milan Stock Exchange headquarters in Piazza Affari, you will find a magnificent 11-meter marble statue representing a giant middle finger. Baptized LOVE (Libertà, Odio, Vendetta, Eternità or Freedom, Hate, Vengeance, Eternity in English), the statue was created by the Italian sculptor Maurizio Cattelan to taunt the financial institution. LOVE sculpture. You can really feel the love! Few people know it but there is a Chinatown in Milan. Just don’t expect a Chinatown the size of New York or even Montreal, this one is quite small. However, you will find lots of shops selling jewellery at unbeatable prices. And if you want to buy some Chinese noodles (in addition to Italian pasta of course!) or Asian groceries, it’s the best place to find them! All located between 1h and 1h30 from Milan, Lake Como, Lake Maggiore and Lake Garda are a good idea for a day trip, if you want to get away from the city. You can find more info about the things to see around the lakes in our article: The 20 best things to do in Italy. At 60 kilometers from Milan, you can visit the beautiful fortified city of Bergamo. Like the lakes, it’s perfect for a day trip! A must see for the upper side of the town, a very nice medieval city. If you have 2 or 3 days, your should really seize the opportunity to visit Turin during your trip in Italy. The city is only at 1 hour by express train from Milan! You can find all my best tips to visit Turin in my article: Visit Turin: the ultimate guide. Start by visiting Milan Cathedral in the morning, trying to be there 15 to 30 minutes before the opening. 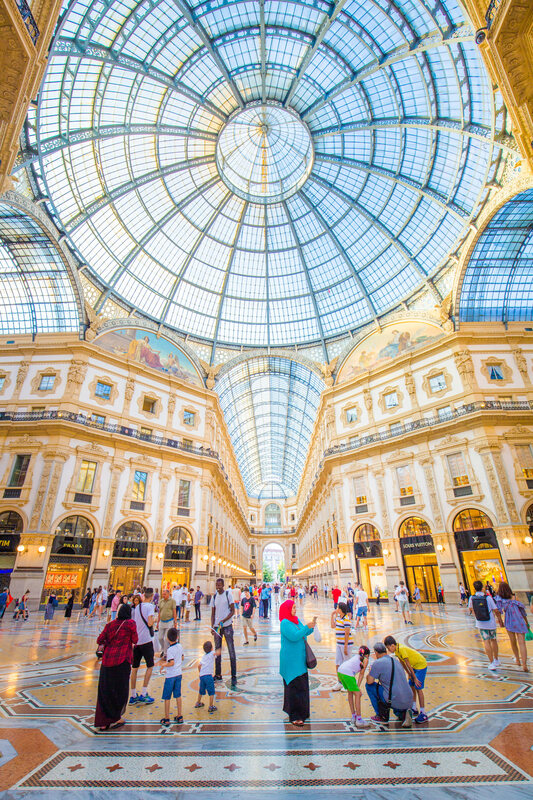 Then, have a walk in the Galleria Vittorio Emanuele II, the beautiful luxury shopping mall located just next to the cathedral. After the meal, head to Sforza Castle, its museums and Parco Sempione, about 10-15 minutes walk from the Cathedral of Milan. Another solution that can be interesting is to take the Hop-on Hop-off bus and see all Milan’s best points of interest in a day. Book your tickets now! The Monumental Cemetery in the morning. The visit takes 1h-1h30. If you feel like walking a bit (about 40 minutes), you can walk to the Leonardo Da Vinci Science and Technology Museum, passing by the Arco della Pace. Otherwise, take the bus or subway! After visiting the museum, take a walk to St. Ambrose Basilica, which is just 5 minutes away. Don’t miss the original architecture of Castello Cova, located next to it. 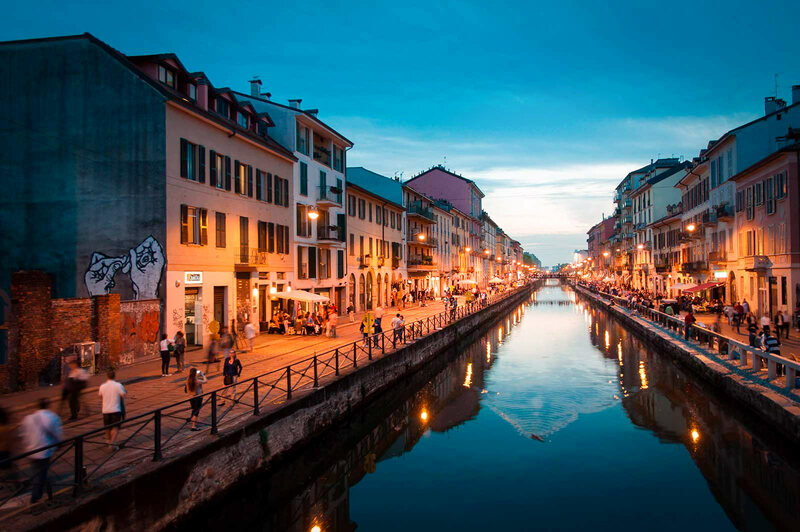 In the evening, head to the Navigli district. It’s very nice at dusk! if you have planned to Visit Milan in 2 days, I highly recommend you to take the Milan pass (buy it here). It can be used as a skip the line ticket for Milan’s best attractions like the Duomo and Lac Scala opera. With the pass, you also get free unlimited access to public transport as well as many rebates for 48h. 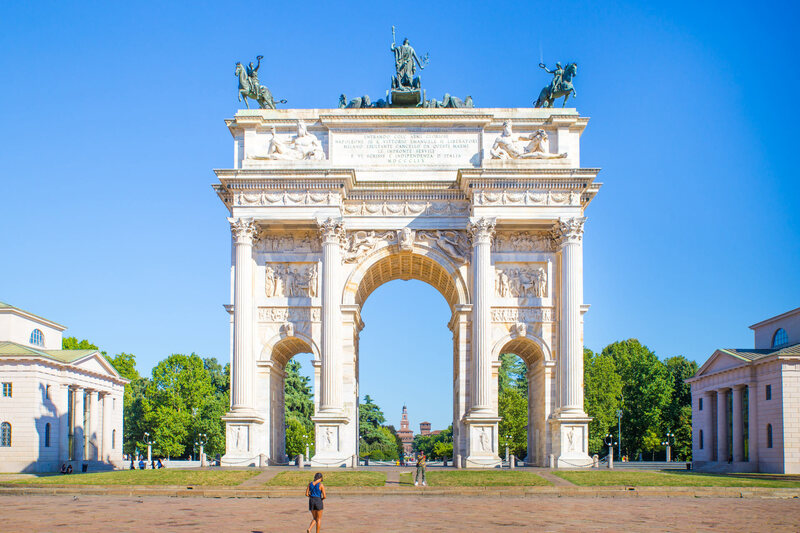 3 days in Milan will allow you to discover the city a bit more in depth, or to take a day trip to one of the many points of interest around Milan. 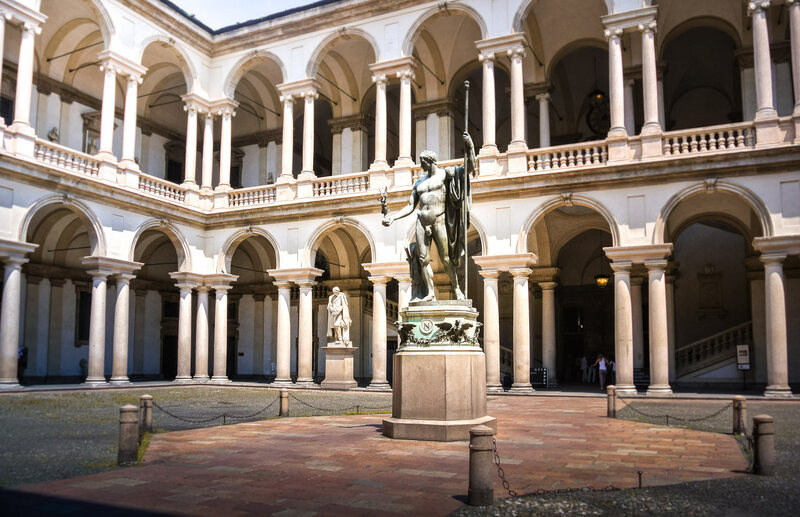 If you plan to stay in the city, you can seize the opportunity and visit 1 or 2 other museums such as the Pinacoteca or the Royal Palace of Milan. And of course, do some shopping! You are in the fashion capital after all. Another option is to go for a day trip to Lake Como, about 1 hour from Milan by train or car. The city of Bergamo is a great alternative, less than an hour away. And I am telling you, it’s worth a look! Da Vinci Hotel: Located away from the city center but only 10 minutes walk from a metro station. Huge double room with modern and bright decoration from 54€ per night, breakfast included. What I loved: quiet, spacious rooms, free parking, and the big breakfast buffet. My favorite for its amazing value for money! 43 Station Hotel: 2 steps away from Milan Central Station. Modern and spacious room from 89€ per night, breakfast at 8€. Strong points: Brand new and well equipped hotel, generous breakfast, great location. Suite Milano Duomo: 5 stars hotel located at only 5 minutes walk from Milan Cathedral. Large design rooms starting at 325€ per night. Strong points: the location, the welcome, the staff. It’s the best hotel for a luxury stay in Milan! First of all, I strongly recommend you to avoid the touristic areas (like around the Piazza del Duomo) if you want to have a good meal. I went to have a look in the restaurants next to this famous place, and I realized that the pizzas served were coming straight out of the freezer! A shame for an Italian city! I asked the waiter of a restaurant, and he confirmed me the majority of tourist restaurants don’t even have pizzaiolo. Rizzocomeacasa: Superb little Italian bistro. Fresh products, homemade, copious dishes for a very reasonable price. Delicious desserts. Awesome value for money. Pizzium: Excellent pizzeria located close to the Monumental cemetery and Chinatown. Between 7 and 13€ a pizza with fresh produces. You should also try the desserts! Top class service, very welcoming and smiling staff. Go early to make sure you get a seat. Nerino Dieci Trattoria: Located in a street close to the Pinacoteca di Brera. Excellent cuisine, meticulous presentation, succulent dishes at a very reasonable price. We haven’t tried it, but apparently the “tiramisu trio” is awesome! Booking strongly recommended. The reputation of Milan Cathedral isn’t overrated, I was really impressed by the exterior facade’s details fineness. The same goes for the Galleria Vittorio Emanuel II, whose architecture is simply astonishing. These are the 2 best places to visit in Milan. On the other hand, I did not think there would be so many people, the city is really very touristy. The piazza del Duomo is constantly invaded by a gigantic crowd. You will find yourself quickly assaulted by selfie sticks, bracelets, scarves, whatever sellers. It’s a very common practice in Milan, and the insistence of salesmen, although nice, makes it somewhat annoying. However, it is a flaw you will quickly forgive to the city of Milan, which is worth seeing at least once in a lifetime, especially for the Galleria Vittorio Emanuel II and the Milan Cathedral. And you, what have you planned to visit in Milan? I am going to Milan and Turin for 5 days in june, and at first I planned to spend 3 days in Milan and 2 in Turin. However, from your articles, it seems that it would be wiser to do the contrary. Do you think there are more things to do in Turin than Milan? Is 2 days in Milan really enough to visit the city? Yes, it is definitely wiser to spend 3 days in Turin and 2 in Milan. Milan is a great city to visit, but there are less must-see tourist attractions than in Turin, and they are very close to each others. So yes, two days in Milan is enough for the main points of interest! Enjoy your stay in the city.